Integrated, patent-pending venting channels dramatically reduce the force required to remove a filled can liner. Improved ProTouch handles provide a fully-rounded, comfortable grip. Can liner cinches allow easy, one-step bag retention. Durable and reliable for both the residential and commercial environment, this seamless design, is made of polyethylene construction that won’t dent, rust or leak. 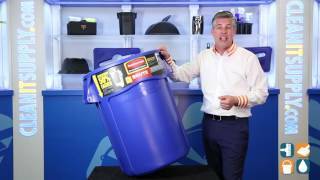 Rubbermaid quality can be seen through the reinforced rim and base that set the standard for garbage can quality. Double-ribbed base and reinforced rim for increased strength and stability. 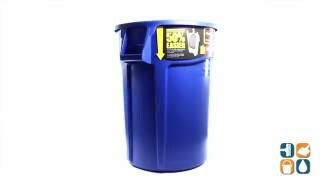 This blue-colored can is NSF/USDA approved for food contact and NSF tested/certified. 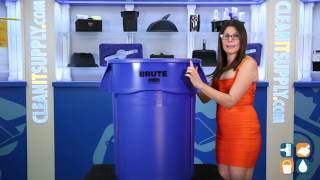 Trash can lids for this can are sold separately: Brute Self Draining Lid RCP 2645-60; Brute Dome Top Lid RCP 2647-88 GRA. Container size: 24" diameter 31-1/2" height. Shipping weight 13 lbs. I use this to mix saltwater for my reef aquarium. I tested the water after 24hrs for nitrates and phosphates and both were non existent on my hannah meters. Have had success with the smaller brute but this larger one suits my needs perfectly.